Grates just waiting for foods to stick! There’s nothing more frustrating than foods that stick to the grate. We’ve dealt with this subject numerous times on The Virtual Weber Bulletin Board…a new Weber owner is about to kick his $700 gas grill to the curb in frustration because no matter what he tries, everything seems to stick! In my experience, meats with high fat content like 80/20 burgers and steaks don’t tend to stick. It’s lean cuts like skinless chicken breasts and pork tenderloins that are the problem. Here’s the procedure I use to ensure the least amount of sticking when I grill lean meats. Light all burners. Preheat the grill on the highest heat setting for 10 minutes to burn-off residue from the last grilling session. Use a grill brush to remove any residue from the grates. Before putting food on the grill, examine the grates for any brush or scrubber bits that would be dangerous if eaten and carefully remove them. 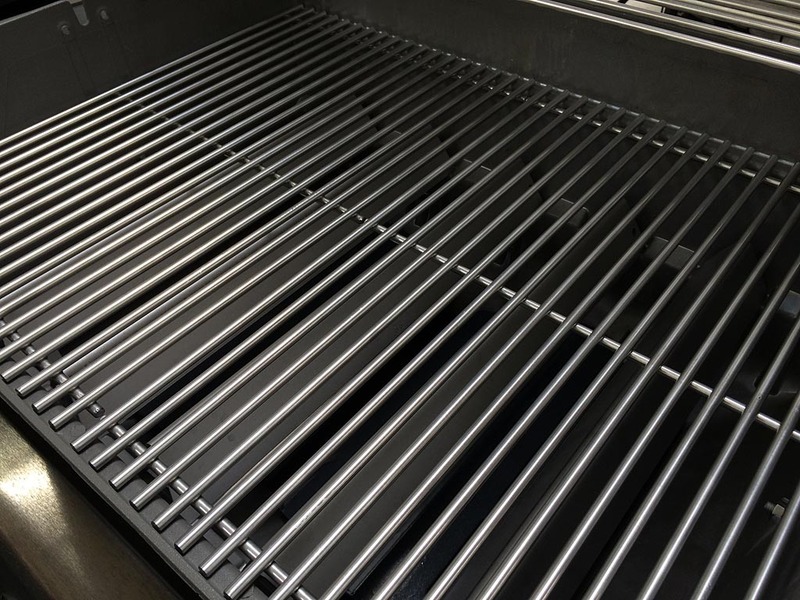 After cleaning the grates, adjust the burners to your desired setting and allow the grill temperature to stabilize. Spray the surface of the lean meat with non-stick cooking spray before placing it on the grate. You can spray right over any dry seasonings or rub. If using a marinade, pat-off any excess before spraying. Place the sprayed side down on the grate. Allow the meat to get a good sear on the first side before turning. Some meats will initially stick a lot but then release when a good sear has developed. When turning meat, use a large spatula to carefully separate it from the grate, lift it high above the grate and spray the top side, then place the sprayed side down. Spraying meat on the grate may result in dangerous flare-ups and is not recommended. It’s usually not necessary to spray again after both sides have been seared. Just carefully work that large spatula under the meat when turning it. Many experts recommend oiling grates before grilling. I don’t find this to be a particularly effective technique, but here’s how to do it if you want to give it a try. Place a good amount of vegetable oil in a small bowl. After Step 3 above, wipe vegetable oil on the grates using long tongs and a large wad of paper towels. Repeat up to 10 times to create a somewhat non-stick surface. You must repeat this process each time you grill.